I closed my eyes, closed my ears. Yet, I could hear my country cry beside me. My ears throbbed in pain, my mind was on fire as the cries of my fellow countrymen, from the infants to the olds, reached my ears. I could not control myself. Tears flooded from my eyes, rolled their way through my cheeks and soaked into my cloth. I scanned among the crowed looking if anyone was severely hurt. Nope, I sighed a breath of relief. And then it came to me, somewhere near, somewhere far, someone must be crying loudly, asking for help to drag their body, which was just been hit by the boulder of cement and bricks that were dispatched by the earthquake, but no one had the guts to go back and help. It was tormenting. I fell into my knees and silently cried. Hundreds and hundreds of people swarmed onto the road. Tension, fear and aghast was in the air. Eyes seemed to cry yet the tears wouldn’t fall. The aftershocks were continuously hunting us. Reaction was almost impossible. We struggled with other people who were fighting to escape, all consumed by fear. The shrill cries of the children made the whole environment cry for an instant. And many of them were from KENJI INTERNATIONAL SCHOOL. “Sirbuwa” , they hurled themselves into me grabbing my arms and looking at me with those innocent little eyes. The short, yet fast breaths of those little children hummed in my ears. I could easily feel their small little heart beating so fast and so strong. And that sent shivers down my spine, every now and then. One in ten people were able to hear someone in the other end of their phone. And that is how we came to know of the massive destruction. Death tolls had already reached 500 and were counting. I was safe and so was my family. I got calls from almost all of my relatives and ensured that all of them were safe even though some forms of properties were destroyed. Adrenaline rushed through my veins, suggesting me to stand up and march my way to help the people who needed my help. But then, it occurred to me. How could I leave these people scattered on the street? How could I leave all those children abandoned who do not quite yet have the idea of what was going on? How could I leave my sons and daughters that I took care of as a fatherly figure in my school? I reversed my gear and looked around the crowd. Those scared looks motivated me for helping them to somehow survive the night. I had an idea. The magnitude of the aftershocks gradually became weaker and weaker. And with all the courage I gathered, I made my way to the school’s compound. I looked around. No cracks, no wears and tears. A perfect place to spend a sleepless night. I pictured my children merrily playing on this same ground, innocent little children, vulnerable as a flower bud. A tear escaped my eyes. I held my breath and sneaked back into the building of KENJI INTERNATIONAL SCHOOL, as carefull as a cat, chanting out prayers and hoping that nothing goes wrong. I scanned all the rooms and the ceilings, not even a crack. ( maybe because of the tormenting situation and the darkness that was making it’s way towards us, I couldn’t quite see them ) The book racks and other materials were scattered on the floor, I just hoped that they weren’t damaged. I ran into the store room, searched for the tents and as my eyes found them, I jumped and grabbed them. As soon as I grabbed, it felt that whole of the ground underneath me is coming undone. I ran, ran like the wind, holding those three tents that the school owned . I faced the tormenting stares of those who cared about me. My family screamed at me. I calmed myself down and I smiled at them. I felt glad of the fact that we were safe, at least until now. I glanced at my 17 year old son and summoned him to come and help be build a temporary shelter to the people, everyone. We went back to the school compound and observed the ground and calculated how much the tents, we had, would cover the ground. We started to work. And slowly a few of the men came and helped us do what we had to do, as a human being, as a being with humanity. We build the temporary shelter the covered almost 3/4th of the compound. We also brought down our gate and kept it aside so that it would not act as a hurdle if, as in fear, any of us had to run out during a quake which was expected to come afterwards. As soon as we did that, I could sense a form of relief within those people. A hint of smile spread across their face. Children stopped crying. All my children (students) around there came up to me and held me; this gave me a lot of emotional assistance. And all of this made eyes flood once again and tears rolled down. And then I asked all of the members of our society to make themselves comfortable. Some of them went back to their home to bring out necessary supplies for a night but some of them did not have enough courage to go back. Me and my son, we went up to our home and came down with some food supplies that would be enough for around 10 families and for a night. Darkness was slowly making it’s way to us. It was not the situation to sit around and cry. We had to somehow manage a place to survive the night. The night was an abomination, aftershock haunted us for almost every hour. It was a sleepless night. Children (students ) sat around me asking to tell them stories and to sing songs. I did not hesitate. “Gauche, the cellist; The restaurant of many orders; Night train to the stars” were the stories that I told them. I told them about the famous MIYAZAWA KENJI, told them everything that I knew. The next day, 26th April, 2015, the telecommunication had been quite stable. And I got mails, messages and phone calls from our Japanese friends. They were worried if any major destructions occurred by this catastrophe. We got inside the school being a lot more than just careful, went thoroughly through all the assets of the school. Many things were found scattered, ruined, broken and were in the unrepairable form. I immediately called all the students to check if they were safe or not. And thankfully, all of them were safe but the children were in shock. No lives were lost but many of their assets and properties ( houses in village and some vehicles ) were completely destroyed. And then I summoned all the teaching members of the school to come in the school to have an emergency meeting. All the teachers too were safe. We were glad to know that we did not lose any of the members of KENJI INTERNATIONAL SCHOOL. We also consulted among the well-wishers of the school, here in our community. We were suggested to mention all the loses of the school to our JAPANESE friends and ask for help and support. I hesitated to ask for help. My heart did not let me ask for support with my friends as I had never done this in my whole life even to get a small thing. From the day, I started this school I had never had a meal outside of my home. Let alone a meal, I had not even drank a cup of coffee. I have always believed that it is always better to be an economical man rather than the one who is not. I told this to all my colleagues. I asked them how is it that I can write seeking for support with my JAPANESE friends. But, I knew, deep in my heart, that it was fully my responsibility to make KENJI INTERNATIONAL SCHOOL survive and make it better. It has always been my dream to teach the little children the vision, the path of MIYAZAWA KENJI and be a better person in life. And then I was obliged to ask for support with all my JAPANESE friends. My heart did not want this but reality was beside me - it was my duel responsibility to share all my joys and sorrows with my will-wishers and my friends. Sharing joys and sorrows with the well-wishers and making the bond stronger, cooperating is one of the major pillars to support the world to be a better place to live. Keeping aside all the pain and sorrows and jumping across the hurdles is what it is to be done to succeed in life. KENJI INTERNATIONAL SCHOOL, blooming with the vision and following the path of KENJI MIYAZAWA, is an elementary school which is far, far away from JAPAN. This garden is to well taken care of so that the flowers can give away it pleasant smell and beauty to the world for better. Promising and determined to take KENJI INTERNATIONAL SCHOOL to a new height and be an exemplary institute, for the first time in 15 years of establishment, I, Nanda Uprety with tears flooding my eyes, started to write letters to my dear friends in JAPAN with its content seeking for help. 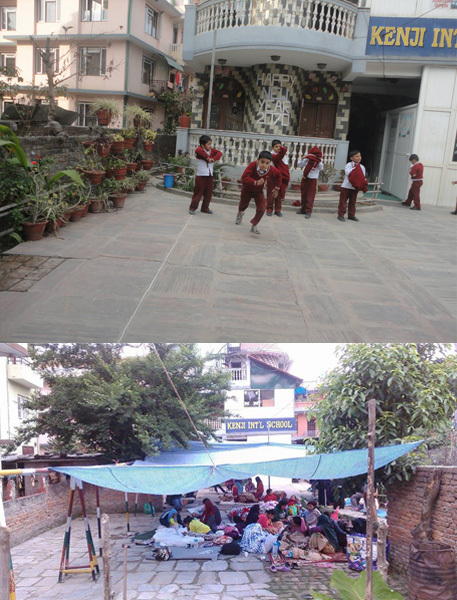 We have tried with all that we have in order to make this school a bridge, a temple, a symbol of relation between JAPAN and NEPAL. We have dreamt of making this institute to be an example of honor and pride that is to be remembered for the generations and generations for the people of IWATE, for the people of JAPAN. Copyright DekunobouMiyazawakenjiClub 2004-2019 All rights reserved.